I hadn’t originally planned on joining my church group to this year’s Mount Vernon by Candlelight, but seeing that the tour comes highly recommended, and since I hadn’t yet been to Mount Vernon (George Washington’s estate to which he retired after the presidency), I decided at the last minute to tag along. I did not regret it. Tour guides showed us what the estate was like at Christmastime in the 1790s, and actors and actresses within the mansion portrayed such persons as Martha Custis Washington and Tobias Lear, providing a convincingly immersive historical experience. 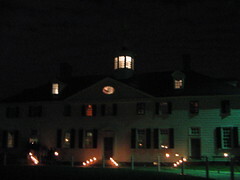 The full Mount Vernon by Candlelight 2005 photoset. Forgive any blurriness; it was nighttime, after all. Photography was not allowed inside the mansion, but I did get a few exterior shots, and the various outbuildings were also interesting. I’ll have to come back to this place in the daytime someday, to check out the art hanging on the walls of the mansion, and to see other parts of the estate in a warmer season. Ooh, one of my fave historical sites. Really glad you decided to blog this. I’m a Washington fan (as well as becoming the Father of our country he was a surveyor, after all) and Mount Vernon has a fascinating history, being rescued from decay and deprivation only in the mid-nineteenth century by the good offices of the Ladies of Mount Vernon. The estate was, originally, vast…but as the property was passed from generation to generation, the cost of maintaining (and entertaining) became ruinous to Washington’s heirs.